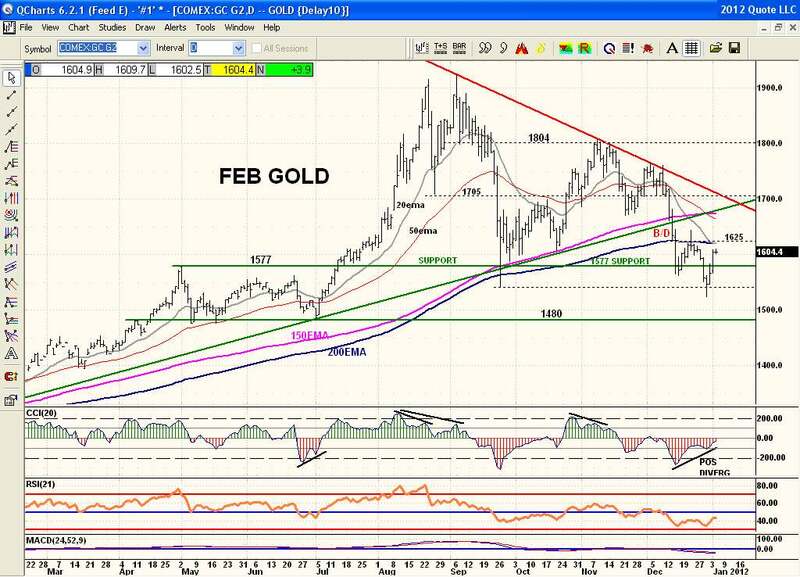 Feb Gold remains below the 150ema and 200ema. This bearish event has not occurred for over 3 years. Last time was in late 2008 and early 2009 with the financial crisis then. Up until recently price has found these moving averages support each and every time tagged or even approached. Price has remained below them for almost 3 weeks now and they are now technical price resistance that must be cleared. The 200ema is also at the falling 20ema and price resistance at 1625. That is the next important price point to clear and hold if an uptrend can be created once again and end this multi month selloff from the early Sept high. All oscillators are stil bearish. Price also broke its one year uptrendline and broke down out of a Symmetrical Triangle. All of which was bearish. So 1st important test is clearing and holding above 1625. Lots of resistance ahead that needs to be cleared and will not likely be an easy task now that price is under so much resistance. Big difference between making new highs with no resistance and being under so many resistance price points. Always more difficult to dig yourself out of a hole.